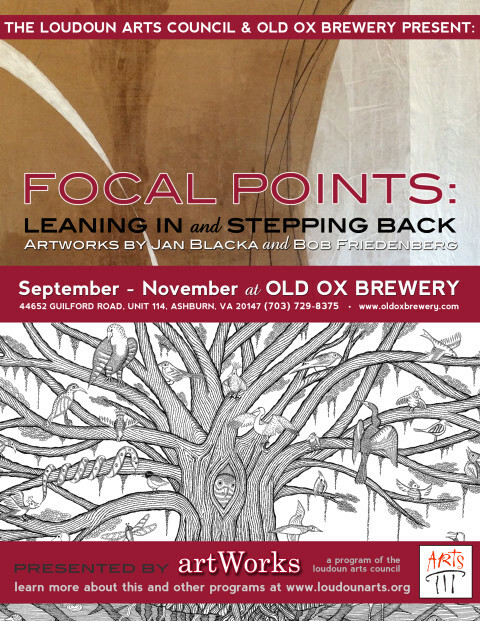 “FOCAL POINTS, Leaning In and Stepping Back”, features the works of LAC members Jan Blacka and Bob Friedenberg. These two artists take radically different approaches in their observations and artistic expressions. Friedenberg, an engineer, uses a mechanical pen to create finely detailed and imagined structures. Blacka, a mixed media artist, uses a wide variety of materials to create dreamy generalized compositions that recall land- or seascapes. The exhibit is on display at Old Ox Brewery, the LAC’s first artWorks partner venue, through November 30. Stop by the brewery Wednesdays through Sundays to have a fine brew. While you’re there, take a closer look, or step back to to get the big picture.